Buddhism Beliefs - What do Buddhists believe? 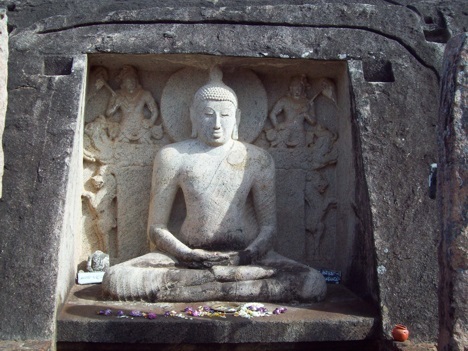 Buddhism originated in India, and largely originates from the teachings of Siddhartha Gautama, known as Buddha, which means "the awakened one". Buddhists recognize Buddha as enlightened teacher who taught how to end suffering (dukkha), and end the cessation of suffering to reach the sublime state of nirvana. Nirvana can be achieved by the elimination of ignorance (avidya), by understanding (pratityasamutpada), and the elimination of desire (tanha). The three core beliefs shared by almost all Buddhists, known as the "Three Jewels" are: the Buddha, the Dharma (the teachings), and the Sangha (the community). There are are various different schools of Buddhism, which differ in the specifics of the path to liberation, the canonicity of various teachings and scriptures, and in other aspects of practising the religion. For further information about what Buddhist beliefs, please review our recommended further reading on Buddhism.